Russia likely to veto British, U.S. and French bid for the Security Council to call out Iran over providing weapons to Houthi rebels. Russia is likely to veto on Monday a British, U.S. and French bid for the United Nations Security Council to call out Iran over providing weapons to Houthi rebels in Yemen, Reuters reported Sunday. The 15-member Security Council has to renew its targeted sanctions on Yemen on Monday. Russia has proposed a rival resolution that would simply extend the mandate of the regime for one year and not mention Iran. The United States has been lobbying for months for Iran to be held accountable at the United Nations over its supplying of weapons to Houthis. Britain drafted a resolution in consultation with the United States and France that initially wanted to condemn Iran for violating an arms embargo on Houthi leaders and include a council commitment to take action over it, noted Reuters. 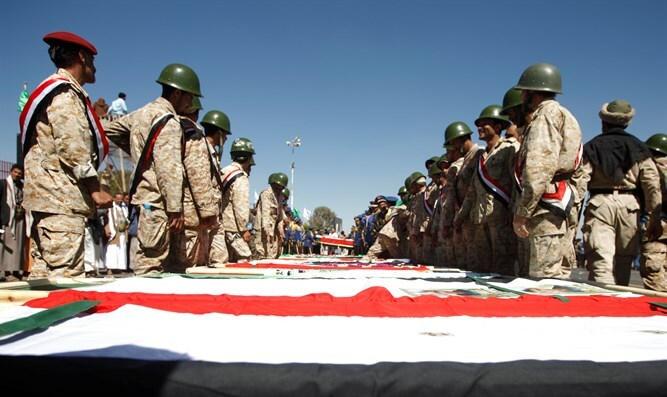 The latest British draft drops the condemnation and instead expresses concern that UN experts monitoring the sanctions reported Iran had violated a targeted arms embargo by failing to stop missiles and unmanned aerial vehicles reaching the Houthis. A UN Security Council resolution needs nine votes in favor and no vetoes by Russia, China, the United States, France or Britain to pass. Both resolutions seek to renew a UN ban on the supply of weapons to Houthi leaders and “those acting on their behalf or at their direction.” It can also blacklist individuals and entities for threatening the peace and stability of Yemen or hindering aid access. U.S. Ambassador Nikki Haley recently brought Security Council envoys to a U.S. military base in Washington to view missile parts that the U.S. calls evidence of Iran’s illicit transfer of prohibited missiles to Iran-backed Houthi rebels in Yemen. The Trump administration maintains that fragments from those missiles, recovered in Saudi Arabia after being launched from Yemen by the Houthis, contain markings proving they were Iranian-made, though some security experts have questioned whether the evidence is foolproof. Iran denies it is backing the Houthis. Russia later dismissed the evidence presented by Haley, insisting that it was unclear whether missiles and weaponry used by the rebels were sent by Iran or whether they were shipped before the arms embargo on Yemen was imposed in 2015. It has long been believed that Iran is planning to use the Houthis to take over Yemen and seize the key strategic port of Aden, which controls the entrance to the Red Sea and ultimately to the Israeli resort city of Eilat. Most recently, the Houthi rebels threatened to prevent international boats from passing through the Red Sea if the Saudi-led Arab coalition continues its attacks on the rebels.